A BREATH OF FRESH AIR - IT'S THE JOYETECH ATOPACK DOLPHIN! Here is a special giveaway for those that want a new vape in their life - after all, it's good to change things around every now and then, right? The winner of the lottery #1163 for A BREATH OF FRESH AIR - IT'S THE JOYETECH ATOPACK DOLPHIN! was Malik Slemani from Uppsala, Sweden on Jan 28, 2019. We just wanted to say thank you for being nice and visiting our sponsor WWW.ANTITPD.COM - not only do they offer extremely good deals in nicotine base (honestly though, if you mix your own juice, these guys are the BEST! ), they also have eliquids and a fantastic, free affiliate program you can make serious side income with. IF YOU VAPE, YOU REALLY NEED TO VISIT THEM - CLICK HERE AND SEE WHY! The super stylish Joyetech ATOPACK Dolphin is an all-in-one vaping platform - or should we say pod? 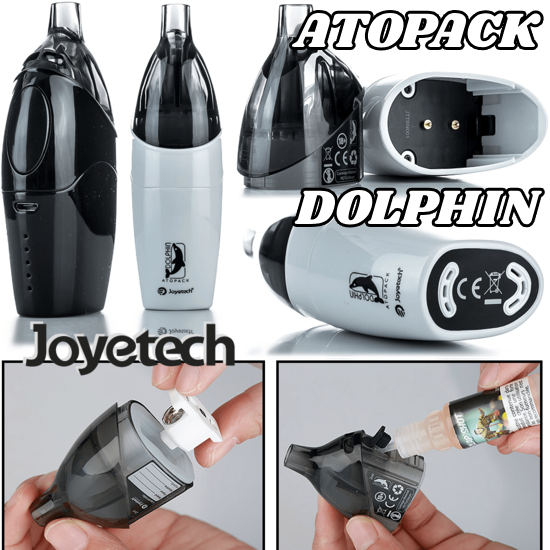 The Joyetech ATOPACK Dolphin is a supremely compact refillable electronic cigarette powered by a 2100mAh inner battery that uses a changeable Juice Vertical Injection Coil (JVIC) system available in both MTL and DL versions. It comes complete with a large capacity 6ml interchangeable pod system specially designed to allow the user to quickly change flavors by simply swapping pods! It's very easy to check eliquid levels with a graduated liquid viewing window, as well. The ATOPACK Dolphin battery can be charged through any USB port and can be charged up to 2A. All that, plus the snazzy esthetics coupled with an easy-to-use single button control mechanism makes the Joyetech ATOPACK Dolphin a fantastic all-in-one kit worthy of any vaper!